Shelving is a must have for almost all of us homeowners. Whether you need something for storage or you want to add a bit to your décor, shelves are the perfect solution. 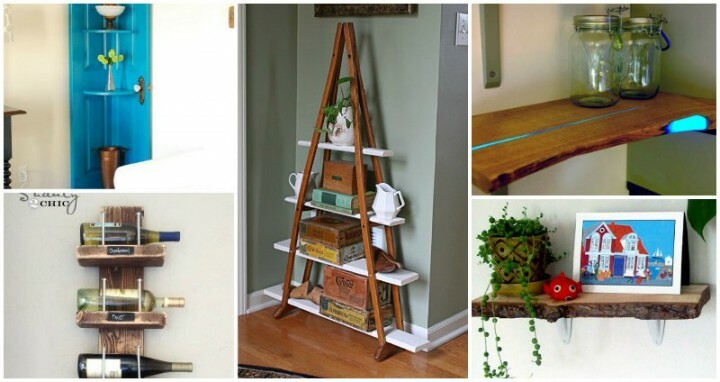 Here is a great collection of Top 20 Brilliant DIY Shelves to Beautify Your Home that you will inspire you for sure. They are frugal, easy, and will add beauty to your home. We have a shelf for every room and every budget. Whether you need something in the bathroom to store beauty supplies or in the nursery for baby items, there is a shelf in here that is perfect for you. DIY Tetris Shelves: Make your own colorful Tetris Shelves! This is a really easy DIY and a very inexpensive way to increase storage. Mandala Bookshelf: This Mandala Bookshelf would look nothing short of spectacular on a feature wall. The best part is it’s actually easy to recreate. You can also repurpose old drawers into crates for this project. Crutch Shelf: You just have to have a pair of crutches and some boards to create the shelves. If you don’t have the crutches, you can find them at flea markets and such and probably for less than $5 per pair, which makes this a unique and cheap shelving idea. You hinge the crutches together to create a sort of ladder look that is perfect for plants or anything else you want to put on it. Reclaimed Wood Honeycomb Shelves: So honeycomb shelves are very popular and really easy to build. You can build them from wood reclaimed from other furniture which also makes them very cheap. You simply have to cut your old boards into the right sizes and use wood glue to hold them together into a great honeycomb shape. Leaning Shelf: This leaning shelf is a great conversation starter and you can build it in less than a day even for beginners. You get five shelves that will hold books or whatever else you want to put on them and you can leave it natural or stain it whatever color you need. It’s a bit whimsical in a Leaning Tower of Pisa style but it’s completely secure so you won’t have to worry about it falling over or your things falling off. DIY Industrial Shelves: The wood and metal work so well together on this industrial shelving unit. Honestly, you could put this anywhere in the house and it would look great. If you have old pipes and elbows lying around that you’re no longer using, this one will be a cinch. 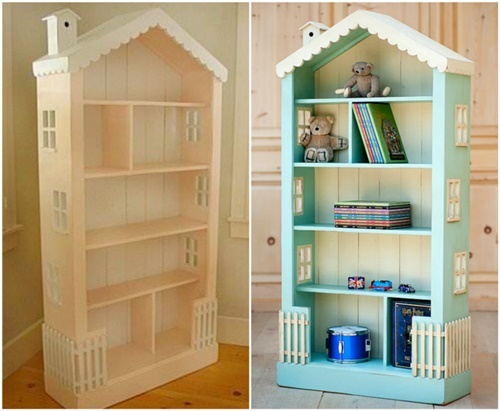 Adorable Dollhouse Shelf: The fairy doll house book case design is perfect for the kids room, you can make it as a stand alone case or incorporate it into a bed head or bed end!